Utah social worker and relationships therapist Julie de Azevedo Hanks was popping up all over the media in May. Hanks, MSW, LCSW, who has been in private practice and owner of Wasatch Family Therapy for a decade, is an expert at getting television news programs, talk shows, radio programs, newspapers and magazines to use her as an expert and regular contributor. Hanks manages her own website, www.juliehanks.com, which was nominated for a 2012 National Association of Social Workers Media Award. Hanks, who is a National Association of Social Workers member, doesn’t claim to be a superwoman. Like many other social workers she juggles being a wife and mother with running a business. However, she thinks other social workers can become media savvy. Create consistent content: If you do set up a website or blog update it regularly. Write weekly about your area of expertise or offer helpful advice to readers. Search engines such as Google are more likely to point viewers to your website if it features newer content. 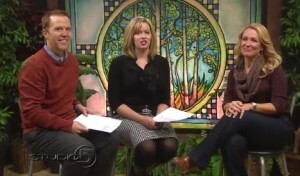 Julie Hanks (right) became a regular contributor on the Studio 5 program on KSL 5 TV in Utah. Use video: Try speaking on video about issues you have expertise in and post them on your website or on social media sites such as Youtube. Often television talk shows and news producers scour Youtube to find experts. Pitch locally: Would you like to appear as an expert on a local news program or talk show? Study the show carefully and figure out whether your area of expertise – family relationships, mental health, or teen behavior, for instance – would be a good fit. Do you offer something they are not offering viewers? Call or email the producer and pitch yourself as a possible asset to the program. Hanks said she has used this approach to land regular television gigs. Embrace social media: Social media is the new “grass roots” of social work. If the content you’re writing is valuable others will share it for you through social media. A growing social media following lets media outlets know the public already values what you have to say. Hanks, who is a native of southern California, is also singer and songwriter and recorded her first CD during her freshman year in college. She married and started a family while pursuing her music career and her social work education and professional endeavors. She said she feels fortunate to be able to reach out to people through her music and use media to help others through social work.